Walk-in clinics are generally the result of a community’s growing need for convenient express care for most minor emergencies. More times than not, the convenience of highly skilled healthcare providers far exceeds wait time one might experience in busy hospital emergency rooms. Beginning the first of March, a growing need for express care will become reality. 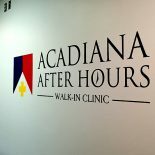 Acadiana After Hours Walk-In Clinic will open its doors to residents of Crowley, Louisiana and adjacent communities. 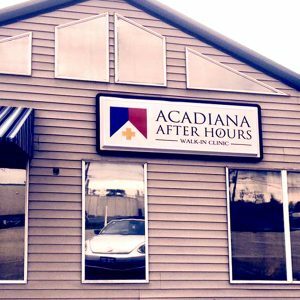 Acadiana After Hours is well prepared to serve and make a difference. The walk-in clinic has been top of mind these days in this small, but diverse community. 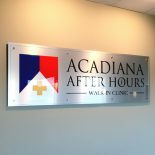 The Acadiana After Hours Walk-In Clinic is well equipped to provide affordable, minor medical and primary care. Its staff consists of professional medical caregivers. It includes highly skilled and emergency trained professionals. It’s been said that architecture is designing form, space and ambience to reflect the environment and social considerations. Pixus was asked to lend its technical and graphic experience to create signage to enhance the aesthetic needs of the new clinic. The lobby signage was created by printing directly on to aluminum. The new and revolutionary swiss Q nyala printing system was used. The lobby signage was mounted using one inch metal standoff spacers to achieve a professional three dimensional look. Additional walls in the clinic were enhanced with affordable adhesive vinyl graphics. The colorful vinyl graphics were printed and cut using the MultiCam Digital Finishing System. 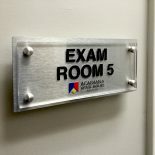 New patients will be directed to their rooms aided by wayfinding signage. The wall signage is digital cut of aluminum and printed on plexi-glas. The signage is mounted again using metal standoffs. 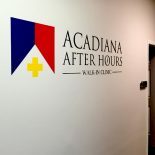 Acadiana After Hours Walk-In facility is located at 155 Oddfellows Rd. in Crowley, Louisiana.